Quail Run Condominiums are located at the base of the ski area approx. 3/4 of a mile from the ski slopes. This unit offers two bedrooms and two bathrooms with a heated one car garage. Situated on the corner of the second floor overlooking open space, this condo feels like a home. The decor exemplifies Steamboat's contemporary flavor: The floor plan features an open Great Room with kitchen, dining and living areas, creating an ideal setting for family meals, entertaining or just relaxing around the fireplace. The master bedroom has king bed and private deck with tremendous views of the ski mountain. A generous sliding glass door opens from the living room to a second deck that hosts a Weber BBQ gas grill & patio furniture. Free city shuttle bus brings guests to the ski area base and Silver Bullet Gondola in minutes. This south mountain location just minutes from the slopes creates tremendous value at this property. This is not your ordinary condo. The living room features a 55' LED LCD TV with home theater surround sound. Sit back in our comfortable sofa in the glow of the fireplace and watch a BluRay - it's like being at the movies, but better! The digital cable provides over 25 movie channels including HBO, Starz!, Encore & Cinemax. It also provides uninterrupted digital music of your choice. The new couch has a fantastic 5' memory foam mattress on the sofa sleeper. Extremely comfortable. No sagging, no bar, no springs. Truly a different experience from the classic sofa sleeper. The two bedrooms are completely separated by the living space so both bedrooms have complete privacy. King bed in the master suite & 2 twins in the 2nd bedroom. The twins can be push together & made up as a king. Perfect for families with kids or just couples! You won't want to leave once you stay with us! Total luxury but still affordable. For your total convenience during ski season, our guests have the full use of our Owner's Ski Locker in Gondola Square for free. Leave your equipment on the mountain so you don't have to lug it back and forth. This is our personal unit and that is how Condos in Steamboat got started 16 years ago. 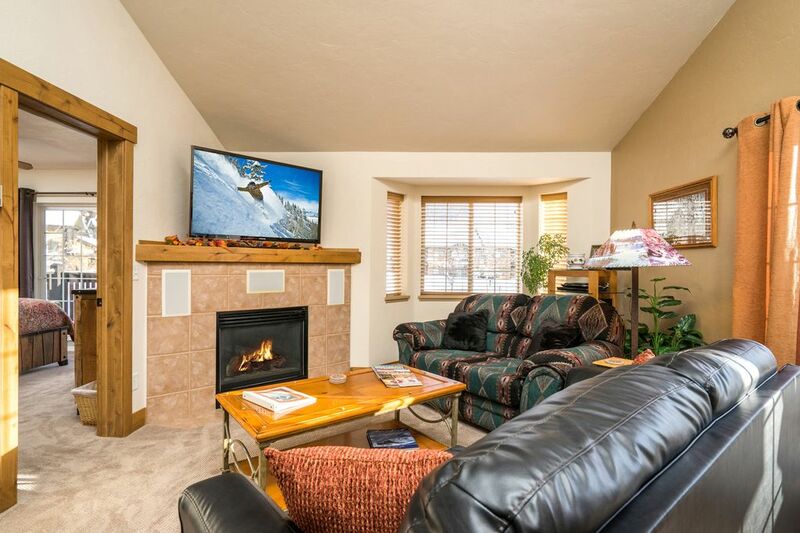 Come stay with us and Condos in Steamboat can organize discount lift tickets, shuttle transfer, rental equipment and more for your stay. Something most vrbo folks can't offer. We can make a difference to your ski vacation budget! Recently renovated with new carpet, paint, doors, granite, fixtures and more. All very exciting and just gorgeous. *Depending on your dates I can save you over $50 per day, per adult off your lift tickets depending on your dates. Massive savings on lift tickets. Kids Ski Free. Restrictions apply on length of stay, minimum purchase on lift tickets. Call Kim Filler at "Condos in Steamboat" for details. vrbo does not allow me to list my phone number. You must reserve your lodging more than several weeks in advance to have the time to order discount lift tickets. The discount does change depending on your dates & when you book. The earlier you book, the more you save! Don't assume, please ask questions via email or call. We live, play and work in the town we love so much - Steamboat Springs. Yes, we are the lucky ones. Come stay with us and we'll show you why we call Steamboat home. We love to travel and we expect a very high standard of accommodation and we have set that limit high at our condos. We own Condos in Steamboat, a small property mgt company. Our son was born here and loves to ski, bike & play hockey. We invested in the town we love so much. If you stay at our Quail Run condo, you will get the best of everything. In fact, we pretty much can guarantee that you will never stay in a 2BR unit of this quality with this many amenities at this price. Great stay for a month to give us a reprieve from the forest fires near Durango. Excellent owners and great help and a lovely place and location. This condo is great! Like new condition, very well furnished and maintained. Kitchen has every item you would ever want - including a French press coffee maker and an electric kettle. Owner is very prompt with replies and highly organized. Easy access to free bus line. Terrific place - stay here! Spent 6 days here during July. It exceeded our expectations. Most fully stocked kitchen I've ever had in a rental condo! Sat out on the decks, watched TV, walked a few blocks up to the Gondola Transit Center and hopped a bus downtown, even baked bread. Steamboat is so much fun in the summer - we didn't run out of things to do. Kim and her crew do a great job. Highly recommend staying here. We spent one week in Steamboat with two couples in this unit and two in a nearby condo. We used this one as our main gathering/eating spot. It was nicely outfitted and worked very well for 8 people eating. Kim was very helpful in lining up the accommodations and we found a nice welcome package of some treats and 2 bottles of wine when we arrived. Kim called to check on us after we arrived to make sure everything was okay. The grill on the deck worked well and the beds were very comfortable. We would not hesitate to stay here again. It is a steep stairway from the garage that would not work well for people with disabilities. Our family wanted to do a skiing vacation for Christmas. A friend in Springfield, Il recommended Kim. From our very first conversation we established an instant rapport. She maintained contact with us from early spring until our arrival at our condo. The accommodations were just like the pictures on her web site. She provided us with ski rental info, discounted lift tickets and directions to our lockers. We had fantastic weather for skiing, and Steamboat is absolutely beautiful. I know that we will be taking more ski vacations, and when we do, we will be renting our condo from Kim & Dan!!! This trip was our third stay in this Quail Run unit, our fourth overall with Kim and family. The unit was in great condition with new granite counters, upgraded woodwork, new carpets and paint. This is in addition to the comfy king bed. It is our favorite place to stay both winter and summer! The included ski locker next to the gondola makes it easy to get out skiing without any hassle. Kim was especially helpful with our late-to-order lift passes and a last minute visit by our son. The ten days sped by with great skiing in the Boat and great place to hang out. It is the best! !